A criminology graduate was bombarded by criticisms from the netizens after his conversation with a man that he threatens on the internet circulated. The conversation went viral on social media in 2017, however, it was mysteriously circulated on the internet this year after it was shared by several criminology students and graduates. Michael James Ramos Ramasasa, a criminology graduate of Philippine College of Criminology (PCCR) allegedly threatened to kidnap the family of Ryan Rycel Cannillas, he even threatened the Canillas that he would harm his girlfriend and burn their house. 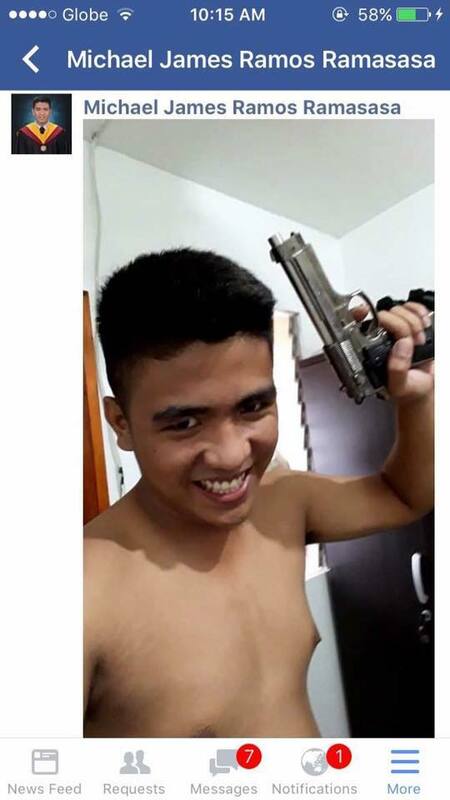 As an evidence that he’s serious in his threat, Michael Ramamasa sent a photo to the victim while holding an alleged firearm. He even included his girlfriend who became the reason of the feud between Ramasasa and Canillas. When Michael Ramamasa traced the school where Canillas studied, he threatened that he would go to his school to finish the job. The criminology graduate also allegedly tried to extort money to Canillas in exchange of the safety of his family and girlfriend. Ramamasa asked for 10,000 pesos in exchange of the head of Canillas’ family and girlfriend. 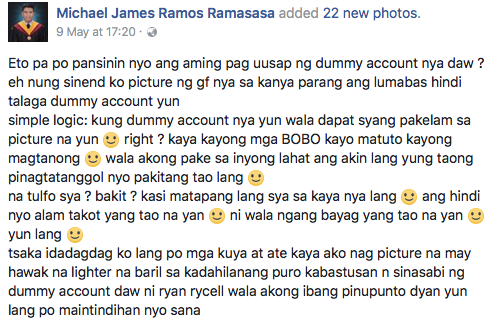 After he went viral, Michael Ramamasa explained on his Facebook page why he chosen to threaten Canillas. He also showed some of the conversation between him and Canillas that the latter didn’t show on the internet. According to him, Canillas disrespected and harassed his girlfriend on the internet, he also even challenged the criminology graduate to a fist fight. When Ramamasa realized that Canillas already crossed the line, he started to threaten the guy who disrespected his girlfriend. Ramamasa even urged Canillas to end their feud and apologize but he didn’t stop in ranting. 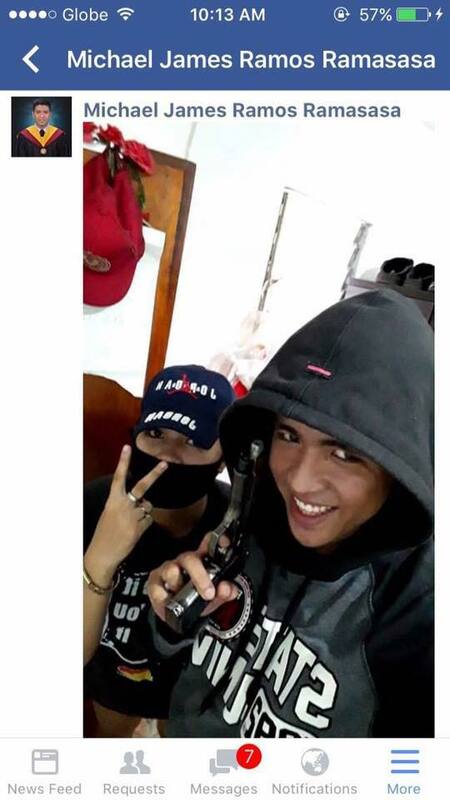 He also clarified that the gun that he’s holding in the photo that he sent to Canillas was fake. Ryan Canillas was also reportedly gone viral before after he was caught punching a passenger inside a public utility vehicle last year. After the explanation of Michael Ramamasa, several netizens realized that Canillas might also wrong for what he did. But they explained that the criminology graduate must not threaten the Canillas because he’s going to be a police soon and he must know how to control his temper. They also believed that Ramamasa should face disciplinary action for what he did. Most of the netizens were also not convinced by the explanation of Ramamasa and they still attacked him on the internet despite the explanation that he gave. If Ramamasa was proven that he threatened someone, he might face violation for grave threat, malicious mischief and extortion. PCCR also conducted an investigation on the case of Ramamasa. “We are currently investigating the matter. Rest assured PCCR does not tolerate or condone any form or acts of violence. Thank you” PCC said in their statement. We are seeking for an update if PCCR already gave a disciplinary action to their student.